To get detailed information about a user from your list, follow these steps. 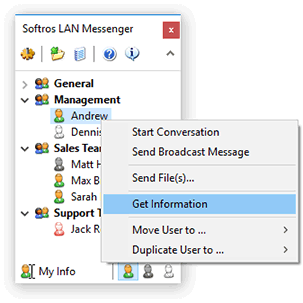 Restore Softros LAN Messenger from the taskbar notification area. Right-click the name of the user whose information you would like to view, and then click Get Information. The dialog box which appears next contains two tabs. 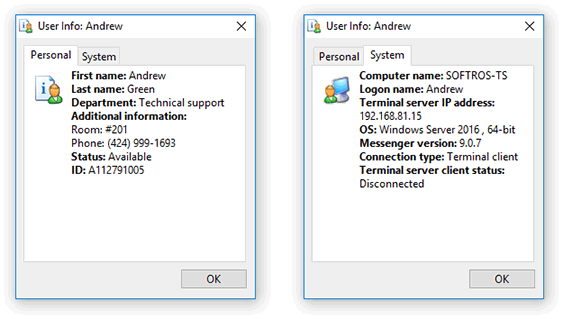 The Personal tab displays information added by the user themselves, while the System tab details their Windows and Softros LAN Messenger configuration. Click OK to close the User Info dialog box.